The first game between the Braves and Red Sox was played at Sarasota, Florida, two hours after the announcement that the Braves were moving, and four days before the National League ratified the move. The Red Sox won, 2-1, with players on both teams reportedly shocked. Within a matter of hours, the Red Sox had booked hotel rooms in Milwaukee to be able to play the Braves there on April 9 and 10.2 Boston’s radio station WHDH planned to broadcast the games, with Curt Gowdy at the mike. Opening Day tickets for County Stadium sold out almost immediately, and ticket sales were brisk at Fenway Park for the planned “return” of the Braves to Boston. 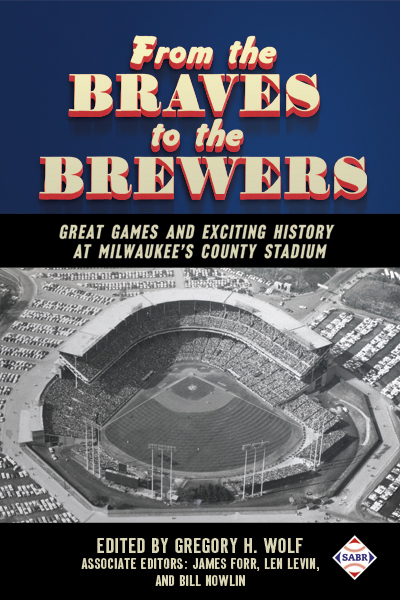 On April 8 the Braves team arrived in Milwaukee and got their first look at their new home, welcomed by “a surging crowd of baseball crazy fans.”3 It had been half a century since major-league baseball had left Milwaukee, and after the team arrived by rail at 10:05 A.M. an estimated 60,000 to 80,000 fans lined the five-mile parade route from the train station and through downtown. The club held its first workout at County Stadium that afternoon. Red Sox catcher Sammy White socked out the first base hit leading off the second. After an out, Tom Umphlett singled through the box and then Milt Bolling hit one through the hole into left field, scoring White; when the throw to the plate glanced off White’s shoulder, Bolling took second and Umphlett third, scoring after the ball was “purposely deflected” by a local photographer.5 Billy Goodman singled home Bolling, and it was 3-0 but Goodman was trapped in a rundown between first and second and the Red Sox rally was snuffed out. Though there were 20,000 expected, the weather had been too discouraging. It proved to be “a damp, dismal affair.”8 There were nonetheless 9,596 fans — nearly double the 5,814 who had taken in the city series game at Braves Field in 1952 and more than double the 4,507 in 1951. The two teams split the set at Fenway Park, with identical scores. The Red Sox won the April 11 game, 4-1, and the Milwaukee Braves won the April 12 game, beating the Bosox, 4-1. In 1954 the Red Sox and Braves squared off in the final five games of the exhibition season, at Bluefield, West Virginia; Louisville; and then three games at County Stadium on April 9 (Braves 3, Red Sox 1), April 10 (Red Sox 5, Braves 1), and April 11 (Red Sox 5, Braves 2). The two teams played other spring-training games against each other, in Florida and in Arizona, in the years to come, but never again met in each other’s big-league ballpark, save for the four midseason Jimmy Fund games in 1957, 1959, 1961, and 1963..
Four years later, Milwaukeeans saw their Braves beat the Yankees in Games Four and Five of the 1957 World Series on the way to a world championship. 1 The Brewers moved to Toledo, Ohio. 2 Boston Traveler, March 16, 1953. 3 United Press story in, among other newspapers, Springfield’s Daily Illinois State Journal, April 9, 1953. 4 Associated Press story, in The Oregonian, April 10, 1953. 5 Boston Herald, April 10, 1953. The Milwaukee Sentinel had Umphlett still on third and one of two scoring on Goodman’s hit. 6 Boston Globe, April 10, 1953. 7 Milwaukee Sentinel, April 10, 1953. 9 Springfield (Massachusetts) Union, April 11, 1953. 10 Though the “Boston City Series” was no more, in 1957 and 1959, the Braves came to Boston and played Jimmy Fund benefit games against the Red Sox at Fenway Park.